We have been posting candid fan pics from the set of Terrence Malick's latest and untitled film starring Ryan Gosling. The movie has an amazing cast including Michael Fassbender. We previously posted the picture below along with many others. 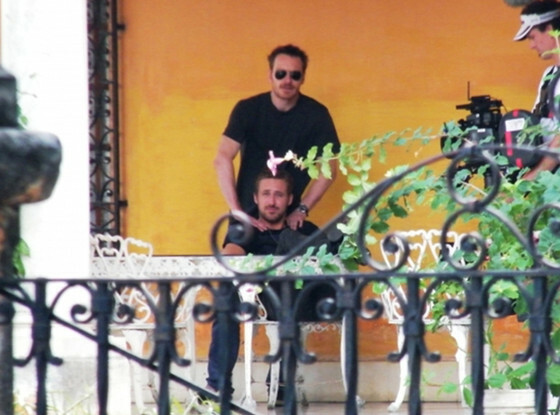 The picture seems to show Michael Fassbender giving Ryan a shoulder massage. Two of today's hottest male stars don't go unnoticed by today's media .... here are some of the comments! "A picture is worth a thousand words, but all the words we can think of right now are inappropriate so you can have all one thousand of them. And if this photograph is not everything you dreamed of, then you're greedy and we hope you have a bad weekend." "If only somehow Michael Fassbender was spotted giving Ryan Gosling a back massage it might erase the sound of those poor singing children… or wait, that actually happened. Enjoy, HERE!" OMG. Also some more pics from their budding bromance while filming in Mexico." We expect there will probably be more said on this .... we'll keep you posted! The story we love is how great Ryan has been to his fans! Please check out our posts below!! Ryan gosling is undoubtedly today's hottest male superstar. He has a charming personality. Is movie drive he is looking very cool and dashing. His drive scorpion jacket is really a good one he is looking more handsome by wearing it.